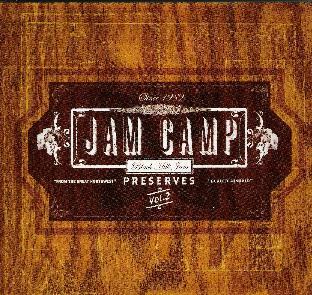 Jam Camp - "Black Hills Jam: Preserves Vol. 2"
With a name like Jam Camp, you might expect this band to be another one of the many Phish imitators out there, but these guys are something different. They do have something in common with the jam bands, in that Jam Camp is all about jamming. Starting with a few loose ideas the band, consisting of David Broyles and Michael “Smitty” Smith on guitars, Steven Munger on sax, Jess White on bass, and Joel Veatch on drums reference numerous genres in rock from classic rock and blues bands, especially The Allman Brothers; more angular prog rock territory like King Crimson; and fusion and jazz artists like Al DiMeola and Brand X, and from there they improvise and jam their hearts out, recording it live as they play. The end result is fusion in its truest sense: a coming together of genres performed by virtuoso musicians. Unlike some of the sterile fusion of more recent years, the textures here are warm and vibrant, with a classic 70’s feel, as the duel guitars snake in and out of the rhythm section, and Munger’s gorgeous sax soars above it all. You can just tell these guys love what they’re doing, and that they’re doing it for the love of it. From the funky swing of the 4-minute Wormhole to the epic 15-minute jams of Swamp Gas & Moonshine and title track, this is a solid 70-minutes of terrific instrumental music. For more information you can visit the Jam Camp web site at: http://www.jamcamp.com.